A child leaving for college is a stressful experience. After all, you watched your child enter the world, you held his hand as he took his first steps, and you listened anxiously as he spoke his first words. It’s normal and natural to have mixed feelings about your child going off to school. One of the best things that you can do as a parent is to help your child develop his financial skills. With financial knowledge, your child will do even better living on his own as an adult. Don’t leave your child’s finances to chance. Simply hoping that he’ll figure things out won’t help him. 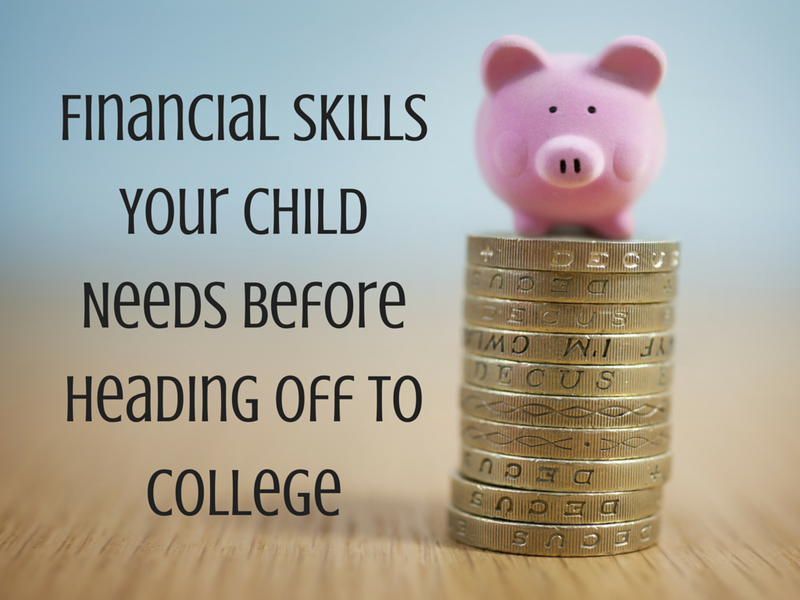 Instead, guide your child before he goes to college so that he understands how to manage his money when he moves out. One of the simplest and most basic financial skills that your teen needs is the ability to open up his own accounts. Whether your teen opens a checking account with a debit card or chooses to apply for a credit card, it’s important that he has the confidence necessary to apply for the financial account that he wants. Explain to your child what information he’ll need for an application and how he can compare rates and fees at different institutions. If possible, open at least one account with your child before he leaves so that he knows how to get started. Whether your child lives in the dorms or an apartment, he’ll have bills to pay. It’s essential that you demonstrate to your child how vital paying his debts on time is. Not only will paying his bills help your child develop his financial skills, but it will also improve his credit score. Explain that even if he pays a bill late one time, this could negatively impact his credit rating. Should your teen wish to apply for a car loan or a mortgage at some point, he’ll want his credit rating to be decent. Before your child heads off to college, show him how you pay your bills at home. Do you use a checkbook? Do you pay your bills online? Do you have an automatic withdrawal system set up with your bank? Show your teen what works for you and let him decide which method he likes best. Perhaps one of the most significant financial skills you can teach your child is how to balance a budget. Your child’s budget will vary based on whether or not he’s working, as well as if you’re still financially supporting him. No matter what his income looks like, he needs to have a plan for how he’ll spend his money. Most college students don’t pay particularly close attention to their budgets. Unfortunately, this can lead to debt. Make sure that your child knows how much he makes, how much he can afford to spend on food, and how much he has left over for luxuries and fun. Remember to remind your child that even though living on a budget isn’t always easy or fun, it will be worth the effort to live a more financially stable lifestyle.